It’s a curious thing for a new president to report on the financial year (2016-17) that concluded before he had moved into the office assigned to him. Yet, reviewing the accomplishments of that year made me feel proud as a supporter of President Tom Kunkel’s and as an alumnus of this great college. By September 2015, having learned of President Kunkel’s pending retirement, I was also and already diving deeply into the college’s needs and aspirations as I thought about drafting an application for the job. Truth to say, those needs and aspirations had never been far from my and Carol’s minds. As proud alums, the concerns of this college have been our concerns since we first set foot on the campus, just as its mission has helped form our own. On December 2, 2016, I was humbled to learn that my next role in higher education would be to lead this fine institution. Over the next six months I had the great privilege of working closely with Tom as he mentored me, briefed me, drew me into decision-making, and brought me to the table with key stakeholders. We had a thoroughgoing weekly phone meeting, and at least once a month, I was able to spend a few days on campus. I couldn’t imagine a better period of preparation and induction and, as Tom’s farewell drew near, my feelings were all of gratitude, friendship and undying respect. It was an exciting time on campus, too, with the completion and dedication of the Mulva Family Fitness & Sports Center – a top-notch facility that includes the college’s first swimming pool. To the long list of generous donors who made this project possible – a list headed, of course, by Jim and Miriam (Brozyna) Mulva ’69 – we were thrilled to be able to add the names of Larry ’68 and Kathy Gentine whose $1 million gift named the new Wellness Center, and former college trustee Jim Kress, whose $1.5 million gift aptly named the Jim Kress Gymnasium “Jim’s Gym”! Our students were able to try out the facilities before they left for the summer, and the first Commencement in the facility followed shortly afterward. Over the summer, as I settled into my own new office, it was a fine thing to watch our coaches move into their finely reimagined building after a year of disruption – a year in which, nonetheless, the Green Knights matched the school record for most conference titles in one year. I was learning fast myself and all the while keeping tabs on the academic front, too. Across campus, in January, the first cohort entered our new Center for Exceptional Leadership; in March, our new Doctor of Pharmacy partnership with the Medical College of Wisconsin was announced; and, in May, the first graduates from our burgeoning MBA program would collect their diplomas. Our own campus continues to draw experts from around the world, as it did in summer 2016 when the college played host to the well-received 2016 ASACCU Conference for student affairs professionals from 44 Catholic colleges and universities. Then, during the fall semester that followed, it was our pleasure to host the college’s first-ever semester-long visiting distinguished scholar, Harry Brod. We would later share in the sense of loss of the academic community when Harry, a founding scholar in the field of masculinities, died this summer. But we were touched beyond measure when, in his obituary notice, his family suggested memorial donations to the newly established Harry Brod Masculinities Studies Collection at St. Norbert College. Another distinguished academic, parasitologist and Fulbright scholar, Tomáš Scholz, joined us on campus for the first six months of this year. And St. Norbert earned a Fulbright of its own when one of the prestigious scholarships was awarded to Maureen Koets ’16. 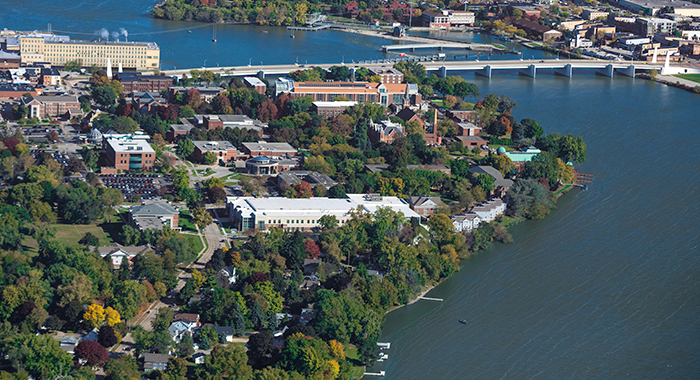 An outstanding academic experience is an important part of the St. Norbert experience. But it’s one that flourishes uniquely in the living learning environment of our residential campus. 2016-17 brought us the chance to offer new living options as the first students moved into the renovated priory building. Riverside and Vander Zanden, both halls well past their sell-by dates, were taken down – opening the way for exciting plans to extend the shrine of St. Mary into a new riverside Grotto of Our Lady and the Kunkel Meditation Garden named to honor Tom and Deb. 2016-17 saw the reinvigoration of the college of chaplains: A group of Norbertines once again share responsibility for sacramental leadership of the college parish. And the staffs of our former Campus Ministry and Faith, Learning & Vocation programs have come together to create the new Emmaus Center for Spiritual Life & Vocation. All this would be for nothing were it not for our intentional efforts to attract a talented and diverse student body. We would welcome another group of gifted, driven and engaged first-year students this fall. The Class of 2021 arrived in De Pere as one of the highest academically profiled and most ethnically diverse classes in our history. In fact, among our first-years, students of color topped 11 percent of their class this year – a new high. We aggressively market the distinctions of a St. Norbert College education to our wide pool of prospective students in what continues to be a very competitive market. This past year of transition revealed significant advances for St. Norbert College and revealed, too, that a deep commitment to our mission endures. As we look to the future and seek new ways to flourish, expect a focused attention on creating an increasingly more rigorous and vibrant educational experience to define our collective work. Thank you for the many ways you have contributed to our success. And, as always, I enthusiastically invite your continued engagement and support as we collectively and confidently advance our mission.